I hear that all the time and read similar accounts on social media where people met their idol and either came away disappointed or were underwhelmed by their interaction with them. It happens more often than people realize: your mind creates this image of the celebrity that they (unknowingly and through no fault of their own) fail to live up to, in person. Me? I had no such lack of luck when I met my idol in February. She had all the grace, class, and personality that I had always heard about and she greeted us with poise earned through countless interactions with her loving public. She certainly lived up to her moniker as “The Queen”. It didn’t really sink in until we pulled up to the yearling barn that her daughter -named Z17 for now- lived in. She was brought out right before the yearlings were turned out into the field, and there was no mistaking whose child she was: she was so patient, even when she was antsy to go run with her friends. Though we were cutting into her turn-out time, Z17 allowed myself and my mom to take pictures with her. My mom doesn’t interact with horses on a consistent basis like I do, and even she felt comfortable enough around Z17 to touch her. 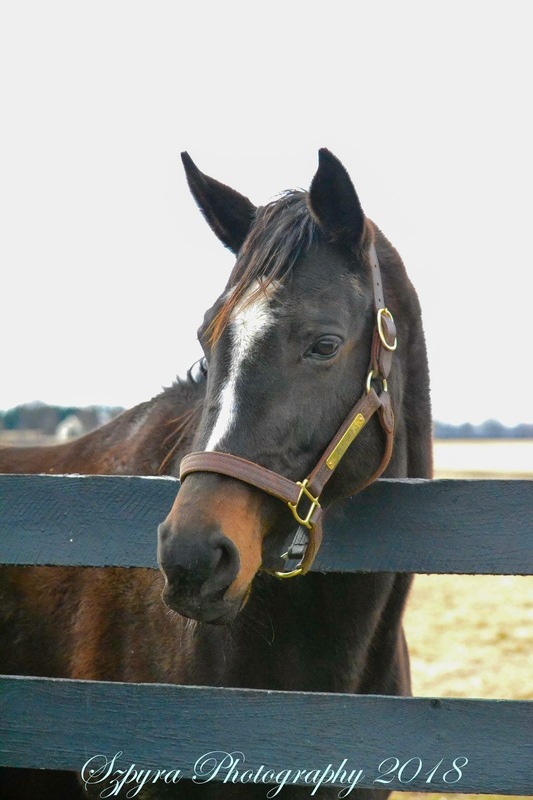 Her beautiful head and coat reflected a lot of her sire, Medaglia d’Oro too. A yearling manager happened to be there when we arrived. I asked how she compared to the filly by War Front who had passed away from a paddock accident. He said that they bore striking similarities. Z17 reminded them a lot of the War Front filly, and the barn staff agreed that both are(were) remarkable specimens. They even talked a bit about Ziconic and the common recollection of him was that he was the racy, typey sort of horse; he was also huge when he was born. Cozmic One (who is now an OTTB in training) is still the largest foal Zenyatta has had by size. After clicking a few pictures of the little princess before she was taken out, we were driven toward the field that Zenyatta had been turned out in. Alys met us, prepared with a camera, and started calling the big mare over to the fence. Louise provided the cookies that would hopefully draw her over, and they proved true as she ambled over to us. Once she came over (at her own pace, of course), Zenyatta was more than happy to relieve us of our cookies. Perhaps she counts them, or she’s memorized how many come per bag, because she was not fooled when we had saved one or two in the hopes of seeing one of the stallions and giving it to them. 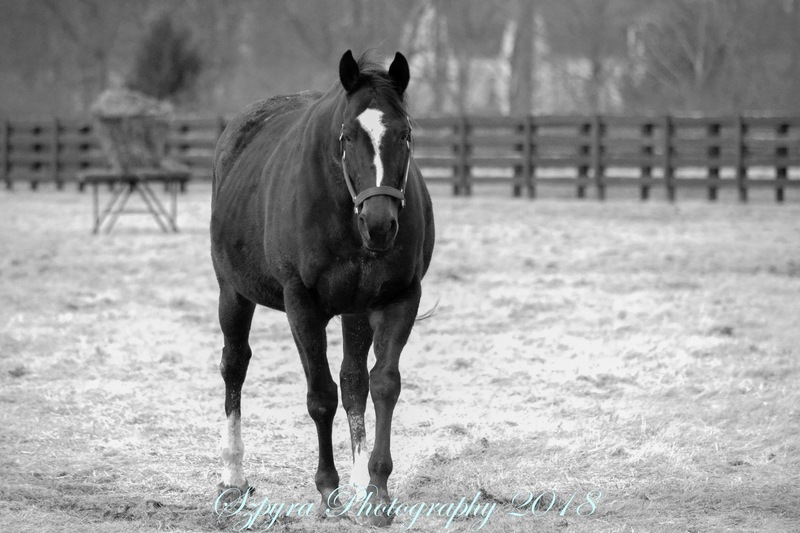 Her paddock mates hung back and when my mom asked why they didn’t come closer for a cookie, we were told that Zenyatta does not share or take kindly to the idea that her cookies went somewhere other than her waiting belly. It was surreal to experience her aura; it was calm and differed from the other mares out in the field with her. I also noticed a very familiar look in her eye, one that I had seen earlier in her daughter. It was amazing how similar they appeared: the same, calm knowing expression was also present in Z17. Neither turned a hair or was anything other than gracious. Several camera clicks later, we were sans treats for Her Majesty. She followed us as we walked along the fence toward the car and my mom took some time to say good-bye to the horse that inspired a burning passion in her daughter that has slowly infected the entire family. They may not know the terminology, but they all know Zenyatta. I watched Zenyatta return to her field mates as Louise drove us toward one of the foaling barns. A truck carrying a recently born foal and a tired mom went by and ended up stopping at the barn we came to visit. We watched as baby was led out, and did its best to keep its feet underneath them. 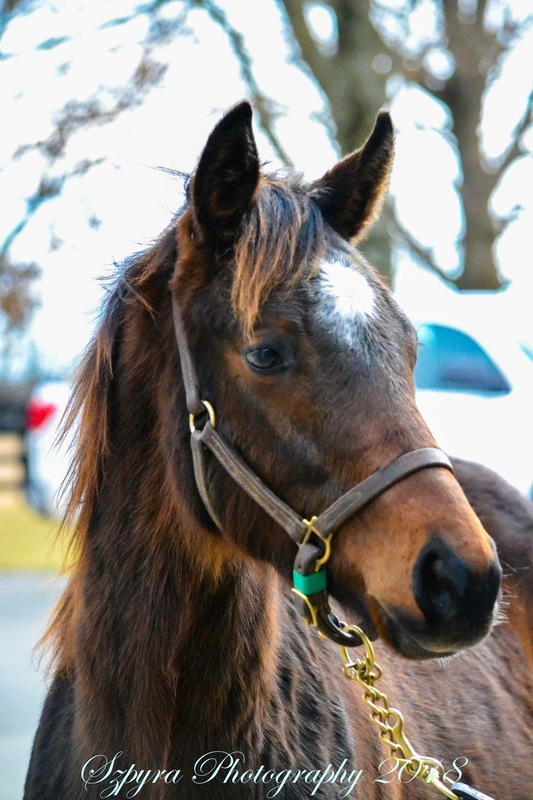 The dam was out of a semi-famous mare herself (also part of Zenyatta’s racing days) and we got to see quite a few of the Moss’ newest additions for the year. I am unsure if I can share names, but I will say that the Mosses (whether it is Ann or Jerry as the owner) like their big broodmares. They’re going to have some lovely yearlings for the sales and racers (if they keep them) based on what I saw and learned of their pedigrees. 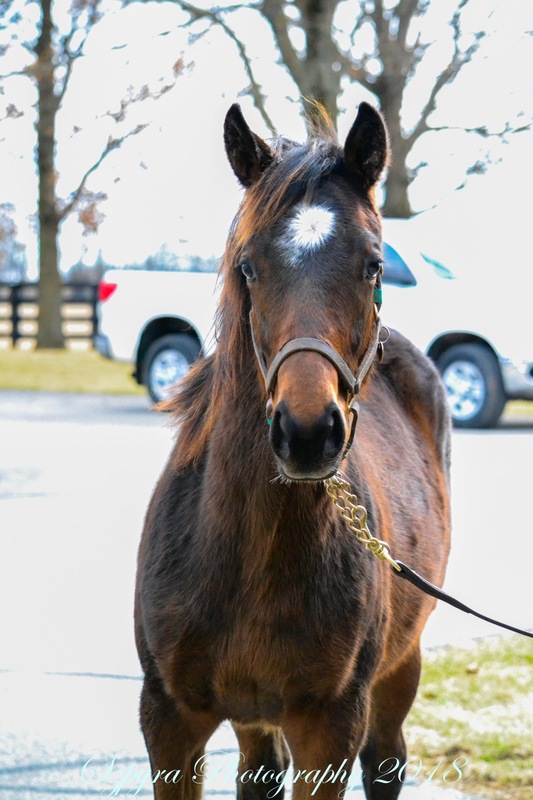 I didn’t take any pictures out of privacy concerns, but I’m sure Lane’s End will be sharing pictures of them once the foals are a bit stronger. To compensate, here is another picture of Z17, who is equally as lovely. Once we had our fill (at least temporarily) of foals, we made the quick trip down to see the stallions. Though they were out in their paddocks, we got to see all the big names: Honor Code, Noble Mission, Tonalist, and even the old man, A.P. Indy, himself. He’s in the same paddock and stall that he’s always been in since coming to Lane’s End, and he apparently gets quite cranky if he doesn’t go out first and run his paddock while his sons, grandsons, and other stallions get led out behind him. He’s still the King of all he sees and that won’t be changing anytime soon either. We came to end of the tour and it was almost heart breaking to have to leave. 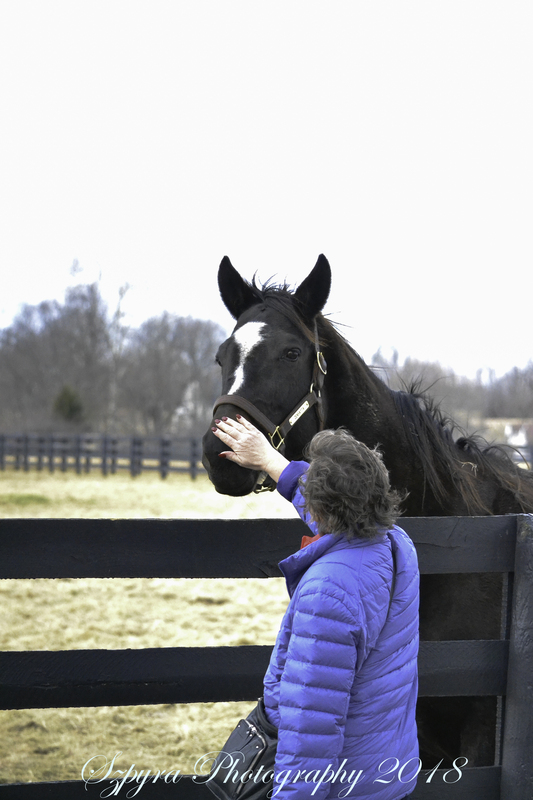 My mother left with an impression that Lane’s End was one of the prettiest farms, and I basked in the feeling of knowing that I touched a racing legend. February 2018 will go down as my favorite month of all time; as the month I visited Zenyatta. Here’s hoping for many more visits in the future! 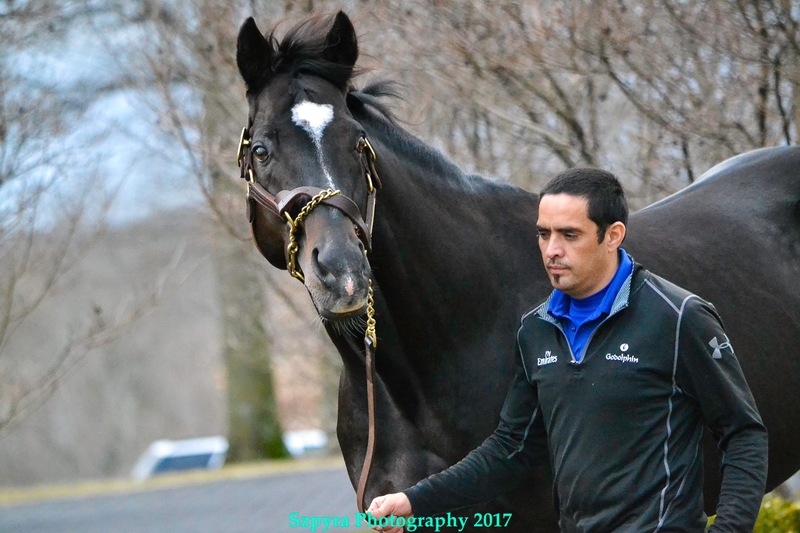 **Update: As of May 11, 2018 Team Z has confirmed that Zenyatta aborted the mentioned foal by Into Mischief. She is reported as healthy, happy, and enjoying the Spring sunshine. You can read that update here.